1. Collaboration works wonders- We are pretty much aware of the blogger collaborations that happen frequently these days; this event done by Indiblogger in association with Berger Paints, re-emphasized the fact that when a group of esteemed bloggers (belonging to widely different domains) come together, they can create history. The painting task proved just that. Such amazing messages being depicted through paintings that were spawned through a collaborative effort. And of course, such legendary paintings were created within It was such a pleasant sight to see a food blogger hugging a fashion blogger in euphoria. 2. Reality often tastes better than fiction- Oh yes, this is indeed one of my most interesting findings of the meet...we have been following a lot of bloggers through various blogging channels, their identity to the readers has been primarily based on their style of writing/style of blog post fabrication and we have our list of favorites. We also tend to create a virtual image of the person whom you follow regularly on the digital space; this event came as a pleasant shocker. I'm glad to have connected to some of my favorite bloggers in this very meet; I'm extremely pleased to conclude that they are even better human beings in real life. Yes, blogging opens up many avenues...it does develop interpersonal relations too. Yes, reality tastes better than fiction at times. 3. Plagiarists are Ugly- Originality in content is the order of the day; we might have all started with accumulating facts and figures from popular online sites/sources, but at the end of the day, the bloggers must produce quality & authentic content. In case, there's a requirement to take references from external sources, a blogger must accord credits to the original content owner. Copy-pasting bluntly from external sources can never build readership; on the contrary it has a detrimental effect on the blogger's reputation. 4. "Sanding" process is extremely critical- This principle absolutely goes in close concord with the revolutionary expeditious yet cogent "sanding" process introduced by Berger Paints, that in effect, removes the jaggedness off your wall before it's painted. Well, that absolutely holds good while fabricating a blog-post isn't it? You do have to "sand off" the roughness, eliminate the oddity and retain only the pertinent portion of your content before publishing blog-post from the "draft" stage. Yes, the finishing touches does create a lot of difference, a blog is your venerated bridge of communication with the otherwise alien world of readers. To ensure a polished, velvety ingress...you need to trim and smoothen the ingrained "roughness" of your draft. 5. It's always great to reminisce- Given a chance, you should always go back to the roots, to your first ever blog-post; the intensity, the zest, the ardor that you had while writing your first online account....and compare with the present. You would definitely discover an amazing evolution in your style of writing, presentation or ways of popularizing your posts. It's a huge learning in effect...it develops you immensely. 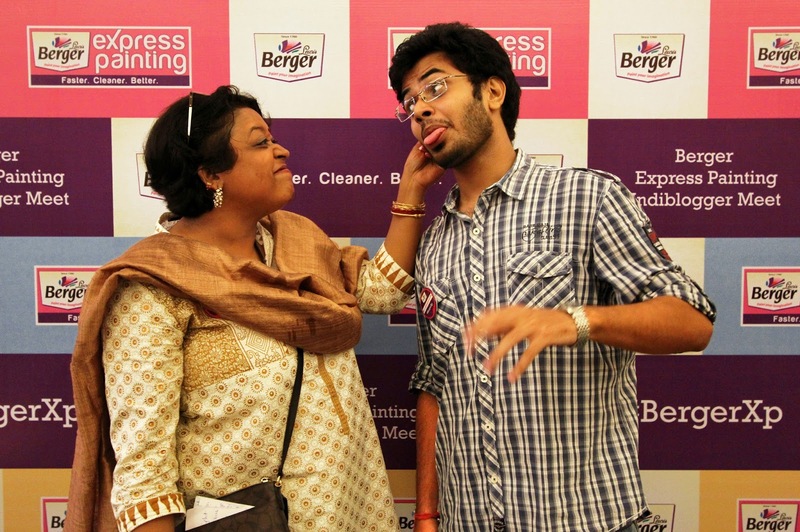 Thankfully, I got a chance to recollect my early days of blogging at the indimeet...and I savored it. 6. Scheduling posts work wonders- This was another fantastic learning from the meet, that too from a very junior blogger. What he said, made a lot of sense. You should ideally publish your posts at a specific time of the day, that makes it easier for your audience to track your posts and relish them. The concept is pretty much like a popular television show that's telecast at a particular time of the day; the viewers would know when to turn change the channel and switch to their favorite television programme. This is suggestion very pragmatic and would love to implement. 7. Bloggers love to pout- Goodness gracious me. I had the impression that perhaps females (read female beauty bloggers) have this intense affinity towards "pouting" in a photograph or selfie...REALITY Check! What I saw in the #BergerXP meet, completely changed my perspective. And I won't dare to elaborate on this. The inference however is interesting- "Bloggers (irrespective of their gender or genre) love to pout." 9. A blogging event can create a buzz on twitter- Well, I'm not too comfortable with calling twitter as a micro-blogging platform but the kind of engagement that the #BergerXP hashtag created on the 140 character platform is remarkable. 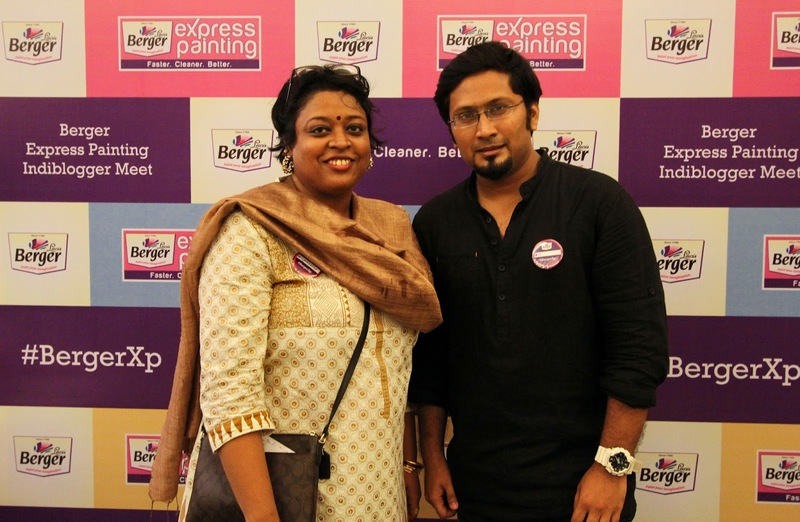 Berger Paints did organize a photography contest on twitter prior to the event (which I won, bwahaha) that unleashed amazing pictures of "Colourful Calcutta". I absolutely agree with my fellow blogger, Anindya-da (incidentally the runner up of the same contest) who has rightly pointed out, the hashtag results of #BergerXP is indeed a great repository of pictures from Calcutta. Infact, I would love to see these pictures being printed in form of a coffee table book real soon. Hats off to this concept. And I'm not even going into the digital impressions stats, I did get to know that the hashtag trended organically. That is amazing indeed. She does this everyday isn't it? Feeling sorry for Anamitra. .....and an even better person.